Sharing a fence-line with the town sump guarantees privacy, natural beauty and wildlife viewing. This summer a family of rats took up residence under the juniper bushes in our yard. They cohabitated with the wild birds we fed, scavenging their dropped seeds. We tolerated their presence and delighted in their scampering through the rose bushes. One evening, a next-door neighbor rang the doorbell and informed me that he saw a rat walking across the yard. I replied with a simple, “ok.” He stressed that perhaps we could call the town to report vermin and request poison control. After much research on humane ways to manage the problem, steps were taken to discourage the rat interest in our yard. We caught two in Havahart™ traps and released them into the nearby abandoned psychiatric center. The others learned to avoid the traps. We ceased feeding the wild birds but the rats lingered. Reluctant to call the authorities, we waited. Just days later, we found a lifeless rat, stiff with death, under the ivy. With no signs of rat life (or death) since then, we assume the neighbor called the town or put down poison himself. Feeling violated that a neighbor would insert himself into our business, without prompting, I pondered the issue in this piece, Reliquary for a Rat Family. Tolerance quickly led to swift reproduction, which, no doubt, would have led to infestation. Hesitation led to others taking action without our knowledge. 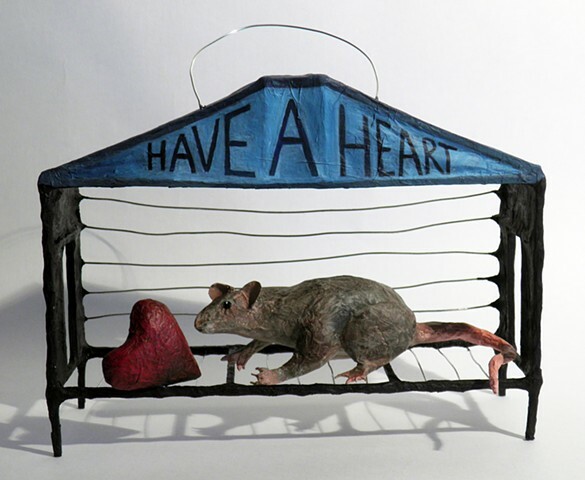 The statement, “Have a heart,” is a reference to the humane trap’s brand name, and calls for the earnest contemplation of managing life and cohabitating with neighbors. The open trap, in house form like my other reliquaries, suggests the invisible and impossible boundaries on space, territory, and home.